They have a unique shape and crunchy texture that's proven to reduce tartar. Plus, with an irresistible taste, they are sure to stir up purrs of joy. Cat dental care has never been easier — or more delicious. Wellness Kittles Grain Free Natural Cat Treats, Salmon & Cranberries Recipe are irresistibly tasty, 100% all-natural wheat free, grain free crunchy treats made in USA only. With nothing artificial and under 2 calories each, you can show your cat extra love with Wellness Kittles natural cat treats. VetIQ Healthy Bites Hairball Remedy for Cats & Kittens - 65 Gm. 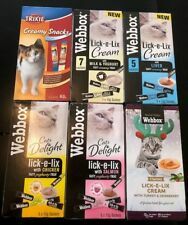 These delicious dual action treats have been formulated to help prevent and remove hairballs, by helping to assist the passage of swallowed fur through the gut. They contain inulin to help support a healthy digestive system and are high in omega 3 and 6 fatty acids. The highly palatable bites are approved by veterinarians and have no artificial colours, flavours or preservatives and are wheat free too. . These unique therapeutic toys are designed to satisfy the chewing instinct of average chewers. Use Nylabone Durable Bones for aggressive chewers.Regular. 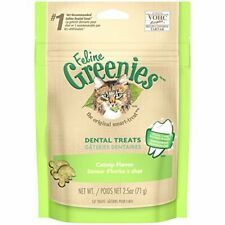 GREENIES - Feline Dental Treats Oven Roasted Chicken Flavor - 2.5 oz. They have a unique shape and crunchy texture that's proven to reduce tartar. Plus, with an irresistible taste, they are sure to stir up purrs of joy. 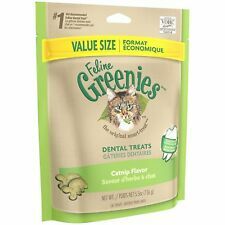 GREENIES - Feline Dental Treats Chicken & Salmon Flavor - 2.5 oz. They have a unique shape and crunchy texture that's proven to reduce tartar. Plus, with an irresistible taste, they are sure to stir up purrs of joy. Watching your cat trying to cough up hairballs can be heart wrenching, and well, a little gross. Keeping Fluffy’s belly in tip-top shape is an excellent way to combat this problem.Get Naked Furball Relief treats for Cats nurture a healthy digestive system with natural dietary fiber and probiotics. With a unique shape and crunchy texture that's proven to reduce tartar, Greenies are also irresistibly tasty. They are sure to stir up purrs of joy. Falvour: Oven Roasted Chicken. Cleans Teeth & Freshens Breath: Our dental treats help clean your cat’s teeth by using their natural chewing action to wipe away tartar buildup from the surface of teeth. Prescription diets can be bland and unappetizing to a cat or dog who may have little appetite to begin with. However, without these prescription diets, a pet with poor health may not live as long. We have been providing Cat-Man-Doo Bonito Sprinkles to Veterinarians for years, now it is available to you. The Everlasting Treats are long lasting dental chews that are hard like a bone to help keep your dog's teeth clean. Pair them with the Starmark Everlasting Treat toys for challenging chewing fun. Fits the everlasting treat ball, everlasting fire plug and everlasting bento ball. VetIQ Healthy Bites Urinary Care for Cats & Kittens - 65 Gm. These delicious dual action treats have been formulated to comprise a crispy cereal shell with a health enhancing cream filled centre packed with amino acids, vitamins, anti-oxidants, essential fatty acids and plant extracts to help support a healthy urinary tract and immune system. These highly palatable bites are approved by veterinarians and have no artificial colours, flavours or preservatives and are wheat free too. .
NEW SEALED TEMPTATIONS SHRIMPY SHRIMP FLAVOR 6.3 OZ CRUNCHY OUTSIDE SOFT INSIDE UNDER 2 CALORIES PER TREAT. Silvervine (Actinidia polygama) is a deciduous climbing vine grown in the high mountainous regions of eastern Asia. 10 x Silvervine Sticks (Actinidia polygama) 10 pc - Activity Cat Chew Teeth clean stick Matatabi cat nip alternative. Low Prices - We research on the web to make sure our prices are the lowest anywhere. We can usually give you a better deal than our competitors. Useful Links. Fish | Tetra. Dogs / Cats | Collars, Leads, Harnesses. 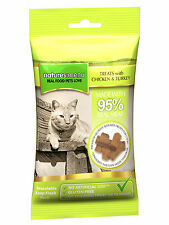 Nature Menu Cat Treats Chicken & Turkey 60g ---Nature's Menu cat treats are scrummy natural Salmon & Trout, Chicken & Liver, or Chicken & Turkey meaty pieces free from any artificial flavours or colours. ---Cut into handy bite sized pieces, Nature's Menu treats are perfect as a training aid, a reward for best behaviour, or just for when you're feeling generous! ---Free from wheat and other grains, gluten, Natures Menu treats are made with 95% fresh meat, whilst the resealable packs help you to make sure that the last treat is every bit as succulent and fresh as the first. ---Ingredients: ---Salmon & Trout: Pork (min 75%), Salmon (min 6%), Trout (min 6%), Minerals.Chicken & Liver: Chicken (min 50%), Pork (min 40%), Liver (min 5%), Minerals. Include your feline friend in the exciting run up to Christmas with this Rosewood Advent Calendar For Cats. Watch the anticipation on your cat’s face each morning as you open a new door, that hides a delicious treat made from yogurt and catnip, so guaranteed to get their attention. ---Feline advent calendar. ---Healthy yogurt and catnip treats. ---Fun Cupid and Comet design. This Rosewood Advent Calendar For Cats is a great way to let your cat be part of the excitement as Christmas approaches, and they’ll soon work out that each door hides a tasty, healthy treat for them. Not suitable for kittens under 3 months of age. This fabulous Rosewood Laser Cat Toy beams a light for cats to chase and play bringing out your cats feline haunting instincts. With an easy to use on/off button this laser light cat toy will provide hours of interactive fin for you and your cat. ⚠️Reasonable care should be given with any cat toy that has a cat herb stimulant like cat nip, silver vine or valerian root. Soft and realistic. ❔ What size: Robbie - approx size: 15cm Total length, actual body 2.5 cm width. Spoil your cat this Christmas with this Luxury Advent Calendar from Rosewood. ---Indulge your cat this Advent with a luxury calendar of 24 doors, which open to provide your cat with a daily heart shaped treat. ---A complementary food for cats. Not suitable for kittens under 3 months old. Feed as a treat or reward anytime as part of a well-balanced diet. 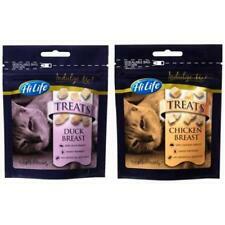 ---Each treat will truly tempt your cat, containing at least 70% real Turkey, Chicken, Duck and Salmon. ---Always provide plenty of fresh water for your pet. Yeowww Catnip Bags, 1 oz ---1 oz bag of catnip that cats will go crazy for! ---100% organically grown american catnip ---Available in resealable bags. 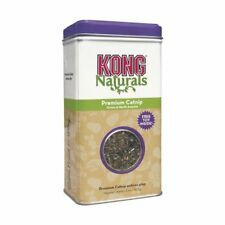 Dental Easy Treats For Cats Beaphar Dental Easy Treat for Cats are easy to administer treats filled with chlorophyll, a natural plant extract well known for its ability to absorb bad smells. The treats are also enriched with fluoride to strengthen the teeth against plaque and has a natural polishing action that helps remove tartar and cleans the teeth. 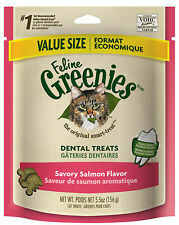 FELINE GREENIES SMARTBITES Healthy Skin and Fur Cat Treats Salmon Flavor 2.1 oz. 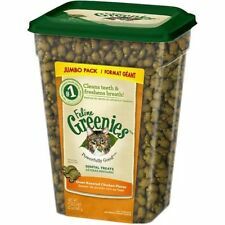 Treat your cat to a delicious snack and essential health benefits with FELINE GREENIES SMARTBITES Treats for Cats. Your cat will also love the salmon flavor of our healthy cat treats. 9 Lives Crunchy Treats 2.1 oz bags - all 3 bags offered!